,LTD KYLIN Medical is one of the leading and professional manufacturer and supplier of Medical equipments and Healthcare products. With our advanced and professional service, we have became one of the most important global medical equipmments supplier. 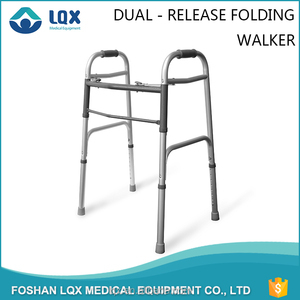 Our products are mainly in various kinds of medical equipments, such as wheelchairs, commodes, walking aids, hospital beds. After sales service: &middot; We respect your feed back after receive the goods. &middot; We are a sales team , with all techinical support from engineer team. Q: Are you a factory or trading company9 A: We are a Professional Manufacturer for Rehabilitation Therapy products. 4 YRS Zhangjiagang Aishun International Trading Co., Ltd.
7 YRS Tianjin Linkang Medical Apparatus Co., Ltd.
4 YRS Hunan Ke Yuan Medical Equipment Selling Co., Ltd.
(1) Sample is available for you to test quality and market. It's okay to change color as you like for mass order. (3) Factory Audit and Trade Fair Meeting are warmly 1 . 5 YRS Guangzhou Topmedi Healthcare Co., Ltd.
11 YRS Caremax Rehabilitation Equipment Co., Ltd.
Luxurious Aluminum One Button Folding Walker Features Polished aluminum frame Single button easily folds walker Fits conveniently into cars and storage spaces Vinyl/Foam handgrips Height adjustable With 3&rdquo; wheels Specifications Weight Capacity: 120 KG Height: 80&mdash;90cm Length: 53 cm Wide: 59 cm Net Weight: 2.6 KG Hi my dear friend, I am Hermen, if you are interested in our products, I am welcome you to send me an E-mail for the detail information or give me a valuable inquiry. Just send to hermen I will reply you as soon as possible. Thank you so much!! 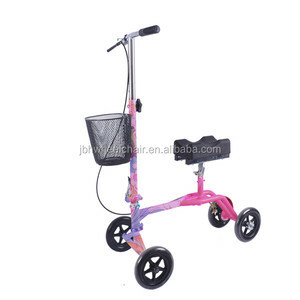 Alibaba.com offers 2,477 exercise walker products. About 30% of these are gym equipment, 9% are rehabilitation therapy supplies, and 3% are strollers, walkers & carriers. A wide variety of exercise walker options are available to you, such as walker & rollator, wheelchair. You can also choose from free samples, paid samples. 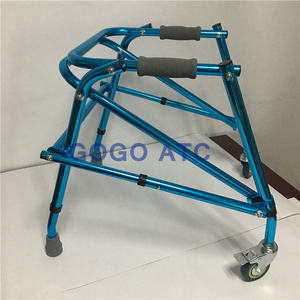 There are 2,477 exercise walker suppliers, mainly located in Asia. The top supplying country is China (Mainland), which supply 100% of exercise walker respectively. Exercise walker products are most popular in North America, Domestic Market, and Western Europe. You can ensure product safety by selecting from certified suppliers, including 656 with ISO9001, 265 with Other, and 223 with ISO14001 certification.